A flood most likely caused by Typhoon Goni has left many already captive animals dead in their cages. The Zelyony Ostrov Park Zoo, also know as "Green Island," was severely flooded after a local river swept through the town of Ussuriysk, Russia, this week. Many of the zoo's animals have been trapped in their waterlogged cages for days, struggling to survive - if they haven't drowned already. Rescuers may not be able to completely rescue the remaining animals for another few days. As of Tuesday, 22 larger animals, such as bears and a lion, were still stranded, waiting without food in the dirty floodwaters. Further complicating rescue efforts, the keys to the animals' cages were lost and the zoo owners have not yet been successfully reached, according to the Daily Mail. Many local residents created makeshift boats to save some of the smaller zoo animals that were left behind after the flood. Kind citizens also brought loaves of bread and fresh water for the larger animals, whom they were unable to help, while they awaited freedom. While it's heartbreaking to know these animals are still helpless, it's even harder knowing many didn't make it through the flood at all. â¥ on Instagram: "ÐÐ¾Ð´ÑÐ²ÐµÑÐ¶Ð´ÐµÐ½Ð¸Ðµ ÑÐ¾Ð¼Ñ ÑÑÐ¾ Ð¼Ñ Ð²ÑÑÑÐ¾ÐµÐ¼ Ð½Ð° Ð»Ð¾Ð´ÐºÐµ Ñ Ð²ÐµÑÐ»Ð°Ð¼Ð¸! Ð¡Ð½Ð¸Ð¼Ð°Ð»Ð¸ Ð²ÑÑ ÑÐµÐ°Ð»ÑÐ½ÑÑ ÑÐ¸ÑÑÐ°ÑÐ¸Ñ!!! ÐÐ¸ÐºÑÐ¾ Ð½Ð¸ÑÐµÐ¼ Ð½Ðµ Ð¿Ð¾Ð¼Ð¾Ð³Ð°ÐµÑ ("
Among the fallen animals were wolves, bobcats, one lion and Masyanya, a bear zoo-goers particularly loved, according to RT. The dead animals were left floating near the flooded enclosures, and camera crews were asked not to film these particular animals out of respect. Some camera crews did manage to travel by boat through the zoo - and what they found was absolutely heartbreaking. Paths and walkways are now completely underwater. A wolf sits on the roof of his cage, surrounded by water, waiting to be rescued. 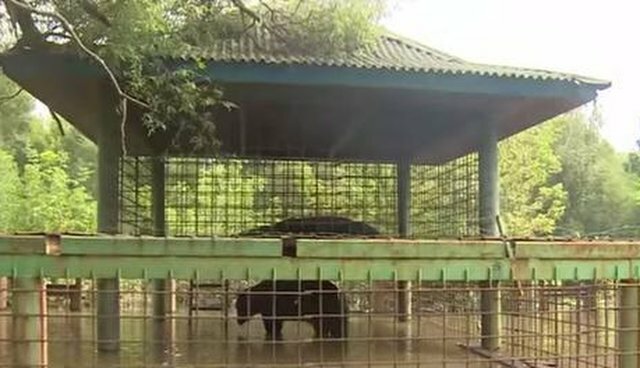 A bear stands trapped in his small cage, unable to sit because of all the water. Animals are left, starving, waiting for water levels to subside so they can be removed from the havoc. "There were to[o] many discussion of [whether] the evacuation was needed or not, that it might be a stress for the animals. But it was people who gave them the stress. The Emergencies Ministry gave the order to evacuate the animals ... I wish we could leave some people there so that they could see the condition the animals are in." These zoo animals were already robbed of a life in the wild and now they left without basic necessities like food and a comfortable, dry place to sleep. Rescue efforts are ongoing, so with any luck, the remaining animals will be out of the destruction very soon.